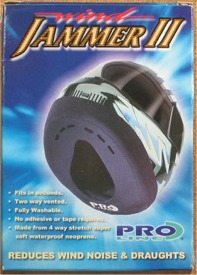 The Windjammer II is a unique product that can decrease motorcycle helmet noise caused by wind buffeting while also providing some extra warmth for cold weather riding. A majority of helmet noise can often be traced to the “dirty” air that causes buffeting up under the neck area of a motorcycle helmet. t causes air to be directed towards the lower part of the helmet. The air that comes up under the neck of a motorcycle helmet during cold-weather riding is also uncomfortable and can decrease overall body temperature. This cooling effect on the huge amount of blood flowing in and out of the head. Next time you ride, place a finger up around where the helmet meets your neck under your ear to see if that decreases the noise. I’ll bet you’ll find a drastic decrease in sound levels. Of course, you should always wear earplugs, which will greatly decrease perceived noise levels whilst protecting your hearing (See the wBW Earplugs and Hearing Protection page for more information). The aerodynamics around the bottom of a helmet is a motorcycle helmet design issue that should really get more attention from helmet manufacturers. That’s because it is a potential source for lots of low-frequency buffeting, and it should be fairly easy to solve with some type of padding. In the meantime, there’s the Windjammer II. I’ve been aware of the Windjammer for some time, and I finally got around to ordering one to try. I’m glad I did — it fits over the bottom of almost any helmet and prevents drafts and noise. Windjammer around bottom of helmet. The inside of the Windjammer II has a 50mm (2″) wide section of some type of sticky substance that grips the helmet. Proline Sports claims that it can be moved from helmet to helmet or repositioned, and I’ve been able to do this successfully, but I’m not sure how long the sticky material will last. It’s a bit of a trick to pull the material tight around the bottom of the helmet. It’s a lot easier to install if there’s someone nearby who can hold the helmet upside-down for you while you stretch the material over the bottom. Once the Windjammer II is installed, it stays securely attached to the helmet, and there should be no need for any further adjustments until it’s removed. The photo to the left shows the Windjammer II as it is installed on my OGK FF-4 helmet. The product doesn’t negatively affect the feel or performance of any helmet that I’ve tried it on in any way. The Windjammer II has 6 small vents in the front (under the chin) and back, but I’m not sure they have much functionality. Helmets seem to have a tendency to fog up a bit more when the Windjammer II is installed, probably due to the blocking of any outside air other than from the helmet’s vents. Another interesting effect is that the Windjammer II seems to help make helmet vents work more efficiently. Either that, or maybe the vented air is more noticeable because it’s not affected by buffeting coming from under the helmet without a Windjammer II installed. The Windjammer II is made of a thin neoprene material with some elastic along the bottom. Once installed, the head entry hole stretches wide enough to make it easy to don the helmet. With the Windjammer II installed and the helmet on, the opening is small enough to just about touch my neck. But it’s completely unnoticeable when I’m wearing the helmet. The neoprene is very soft, so it shouldn’t bother even the most sensitive faces. The Windjammer II really does make a dramatic difference by decreasing the ambient noise level. I tried it on a couple of helmets to the same effect. It’s designed to be used with full-face helmets, but I suppose it could be used successfully with a flip-up helmet. It probably would have to be removed each time the visor was flipped up. List Price (2015): $19.95 Here! From “R.D.” (July 2015): “I have found your website very helpful in learning about the problems of helmet noise. Thanks for focusing on this. I have a 2007 Ducati ST3, love the bike, but the shape of the windshield (and I have bought three) creates turbulence and a lot of low frequency noise under my helmet. I think the tunnel-like structure that it presents creates a vacuum and swirls air such that I get Low frequency booming between my helmet and my shoulder. After giving up on windshield modifications (I even removed the windshield entirely which made the ONLY modest improvement) I went to a fabric store and bought a yard of soft mesh fabric. I put on my jacket and wrapped it around my neck, on top of the jacket, filling the space between my helmet and the helmet with the mesh cloth and then tucked the two ends into the jacket and zipped it up. What it seems to have done is broken the turbulent flow and it now is extremely quiet. So quiet I can actually hear the engine again. Many riders report that if they shrug their shoulders their low frequency buffeting goes away. This does the same thing. My hope is that the mesh will be tolerable in the summer. However while in the fabric store I noticed that they also sell what is called mosquito fabric. I’m going to try that as well. This mosquito fabric has more holes in it and might move more air and be cooler. This solution doesn’t seem to have to stop the air flow to work, just disrupt the turbulent flow. Anyway, I ordered the Windjammer and plan to try it soon but this solution is ridiculously simple and is very effective. Why helmet manufacturers don’t create accessories like this is not understandable as it is a real problem. Perhaps if they provided a fix they would have to admit there was a problem in the first place. From “K.L.” (October 2010): “I will answer the questions on everyone’s mind. You ask, “How did the Windjammer II work?” Well, I will tell you. First, I must point out that my results may be different from the results you experience. You know the routine; your bike, type of windshield, helmet, height, etc. all affect the amount and type of turbulence you encounter. For example, the Arai Profile that I wear is supposed to be a very quiet helmet. As it turns out, it is louder than the Arai RX-7 Corsair that I replaced; a helmet not known to be quiet. I suspect that if I switched to a naked bike, the Profile would indeed be the quieter of the two. However, as it turns out, on the Suzuki GSX650F with a stock screen, the Profile caused an unbearable amount of noise in my ear pockets. So much that my ears would ring after a relatively short ride. Something that has never happened to me in the past. My belief is that noise is due to buffeting caused by air swirling around in the ear pockets. This led me to seek out ear plugs (and the Windjammer II) for the first time. The Windjammer II arrived relatively quickly from the UK. It came within a few days of ordering. With the exchange rate, it cost about $24.00 USD. It is easy to install. You simply stretch it around the bottom of your helmet. The inside of the Windjammer II is tacky and it helps keep it in place. No trace of this sticky substance is left on your helmet. It really doesn’t look too bad on the helmet. If you are using a Bluetooth, like a Scala Rider you may have to make a simple modification to use them both at the same time. I have a Scala Rider, but I haven’t used it with the Windjammer II in place. I think I can easily make a little slice in the Windjammer with a razor blade to allow the Scala unit and mic to fit. Anyway, once you get your head through it (watch your ears!) and into your helmet, you hardly know it is on. I find that the helmet fogs up easily with it in place. It even fogged up with all of the vents open in 60+ degrees. I plan to purchase a Pinlock lens in the future and I hope it helps reduce the fogging. Also, as you can imagine, it gets very warm under the helmet with this in place when the temperature rises. After doing comparison rides with and without the Windjammer II, I can tell you that it does make a difference. It does slightly lower the amount of noise that I receive and it helps reduce the amount of turbulence that I have inside of my helmet. Don’t expect the inside of your helmet to feel like you’re riding inside of an Acura! You are on a bike and will still hear a lot of noise and feel a lot of wind. It will not reduce noise as well as earplugs (BTW – I find that SureFire EP-3 SonicDefenders work well). I can say that without this in place and without ear plugs, my ears will ring after 20 minutes on the freeway. With this in place (and with no earplugs) I do not have that same ringing sensation. So, for me it does reduce the wind from coming into the bottom of my helmet, but I can still hear most of the noise. I did a four hour ride this last Friday with both the Windjammer II installed and earplugs. Other than being very hot, I was comfortable. So, you ask, what my conclusion is. I have mixed feelings. The Windjammer II is not perfect, but does seem to help a little bit. I have become accustom to using ear plugs. I suspect they are the better option if I want to hear when I am a senior citizen. I do think the Windjammer II will be useful for keeping the warmth in during the colder months providing you have something to keep your neck warm and most importantly, you have something that prevents your lens from fogging. From “G.B.” (February 2010): “I bought one a couple of months ago. It reduced the noise level of every one of my helmets I’ve used it on: Shoei X-11, Arai Corsair, OGK FF5, and my Akuma carbon fiber. I have moved it from helmet to helmet with no loss in stickiness, but I’m ordering one for each helmet so that I don’t have to. I’m also ordering one for a friend. From “M.B.” (October 2009): “I bought one of these three seasons ago, in the fall. I tried it on my HJC CL-SP helmet, and while using it, the noise levels went up on my naked bike, and on my fully faired bike, the visor fogged too easily. I had to leave the visor cracked almost all the time, which defeated its purpose. The Jammer was put away, and then this year I remembered that I had it. I had both a new bike and a new helmet- a Shoei TZR and a V-Strom with a short windshield on it. With this combination, the wind blocker works great. 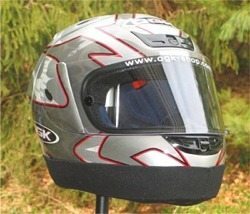 It cuts the noise level considerably, blocks cold air from coming into the helmet, and does not make the visor fog, (as the lower chin vent keeps the visor clear- the air from the short windshield hits just above my neck). I have been using it for the last 2000 miles this fall. Surprisingly, when it the temperature got warmer on a few days, the helmet did not feel much hotter with the Jammer on. From “K.Q.”: “Just a comment about the Windjammer II for your readers. I bought one about 2 weeks ago on the rave reviews from webBikeWorld and elsewhere. I was tired of replacing the Shoei Chin Curtain that fits my Shoei X-Eleven; it would always come apart from all the on-off cycles during the winter. Figured the Windjammer might work better. 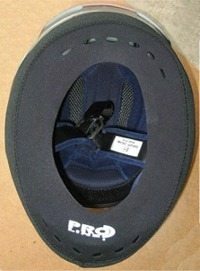 But unfortunately it barely goes on my XXL helmet, and in order to get my head through the Windjammer I have to push/cram the helmet down over my head…hard on my neck. In addition it makes access to the helmet straps awkward, blocking the Shoei “clip” that keeps the strap end attached to the D-rings. Also, on my Burgman 650 Executive (stock) the noise levels went up in the helmet (seems to cause “helmet boom”) as well as it directs air uncomfortably around my neck. Oddly, the little Shoei Chin Curtain works better in the airflow and noise department.